HOW GOOD IS GAME WEEK 7 DREAM TEAM? Want to buy De Bruyne? or Richarlison? read this first. HUH!!!! Now the international break is here! It’s a nightmare for we the arm chair managers for various reasons, the main one being absence of premier league action for a good TWO WEEKS!!!. Other reasons are potential injuries to players that we already own, potential increase in prices to players that we intend to get after the break and the mileage covered by our fpl assets like Sanchez,Coutinho,firmino etc therefore increasing risk of being benched immediately after the break. However, there is a silver lining for every dark cloud, this is a period of reflection and re-strategizing on how to move our teams going forward. 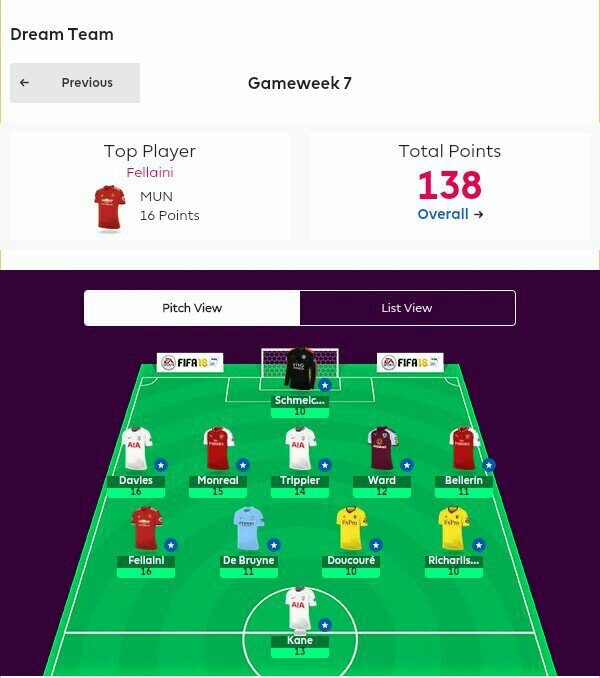 It is because of that reason that we are now launching a new post that will run after every game week, it will be an analysis of the game weeks dream team in order to evaluate their potential and if they are good enough for your team going forward. It is worth noting that only Ben Davies and Stephen Ward appear in the overall dream team at this point of the season. Enough of the introduction, let’s delve straight into the analysis. KASPER SCHMEICHEL 10 points. (£5.0) selected by 4.2% managers (213,716). The Leicester no.1 had one hell of a game week. He made 4 saves which is earned him 1 point, played 90 minutes which got him 2 points, kept a clean sheet earning him 4 points and finally scooped all the 3 bonus points. Over the last 2 seasons, Schmeichel has had 109 and 147 points, making 113 and 100 saves. So far this seasons, he has 33 points 6 of them being bonus points and has kept 2 clean sheets. He has already faced 4 of last seasons top 6 i.e. Arsenal, Manchester united, Chelsea and Liverpool which makes his return of 33 points a very respectable return. His fixtures are also taking a turn for the better considering that he is facing only 2 of last season’s top 6 over their next 10 fixtures. Considering his ownership of a mere 4.2%, Schmeichel is definitely a differential and a good option for managers who are looking to replace the 37.1% owned David De Gea whose fixtures over the next 4 game weeks are not pleasant at all since he’ll be facing Liverpool, Spurs and Chelsea all in the next 4 game weeks. Schmeichel is definitely worth your attention at this point in time, more so if you own a 5.5 goalie, this will give you an extra 0.5 to spend elsewhere, if you already own Schmeichel then do not even think of losing him right now. 2. Ben Davies 16 points. (£5.8) selected by 22.8% of managers (1,088,516). The Welsh international has been an absolutely marvelous fantasy asset to own, he started the season setting you back a criminally low £5.5 but now he has added 0.3 to that. He scored a goal earning 6 points, played 90 minutes getting 2 points, had an assist earning 3 points, had a clean sheet getting 4 points and had 1 bonus point. Towards the end of last season, Davies managed to get a run in the team and he ended the season having 3 assists and a goal, this season he has started exactly where he left last season. In my article last week on “Players to keep and players to lose ahead of game week 7”, you can look at it by clicking here, I encouraged managers to get Davies and since then he has gained an extra 2.8% ownership as well as a price increase of 0.1 as of the time of writing. Despite Tottenham’s next 5 fixtures not looking the most appetizing, you could always count on Davies popping up with a goal or an assist as long as he is being used as a wing back. Danny Rose’s recovery time is not known but at this point in time, Davies has fully earned his own against the out of favour Rose and you’d expect Davies to start in the next foreseeable future. If you have him then hold on to him and don’t be discouraged by the look of his fixtures, if you do not own him then you might want to get him in before his price goes beyond 6.0 because trust me, his price will cross that line soon enough. 2. Nacho Monreal 15 points. (£5.4) selected by 5.6% of managers (262,726). First of all, I have never been the biggest fan of Nacho Monreal or Arsenal’s defenders for that matter, but I must admit I am already having second thoughts on my stand. Nacho Monreal scored 1 goal earning 6 points, played 90 minutes getting 2 points, kept a clean sheet grabbing 4 points, and scooped all the 3 bonus points. Monreal’s fantasy potential was going to be ruined by the signing of Sead Kolasinac and the fact that he now plays at center back, however, to Monreal’s credit, he has been great thus far. With his team collecting 4 clean sheets in their last 4 games, Monreal has been rewarding his fpl believers handsomely, throwing in 8 bonus points for good measure. Seeing as the Spaniard has collected 115 and 152 points in the last 2 seasons, it definitely is no meagre returns for defender who is worth £ 5.4 and playing for a traditional title contender. Despite Arsenal not being re-known for their clean sheets potential, Monreal is worth your investment since he is not the most expensive of defenders he throws in the occasional assist or even goal. If you have Monreal you should keep him, if you don’t have him and are looking for a defender who is priced correctly, I’d recommend Nacho. 3. Kieran Trippier 14 points. (£5.4) selected by 4.0% of managers (173,742). The Englishman ousted Kyle Walker from the first team at the end of last season and played a mere 568 minutes but ended up with a respectable 5 assists. Trippier played 81 minutes getting 2 points, had 2 assists collecting 6 points, was part of a clean sheet keeping defense getting 4 points, and collected 2 bonus points. He started this season as the only senior Right back at spurs and was looking like a must have defender before Serge Aurier was brought in from PSG. Aurier has a reputation of ill-discipline and got a red card in his first start for the White Hart lane outfit, thrusting Trippier back into the team. Trippier costs a lowly £5.4 and if you are an active manager who can monitor Aurier’s progress and re-integration back to the starting 11, then you can enjoy what Trippier brings to your team, i.e. goals, assists and clean sheets. But if you are not active enough to monitor the Right Back situation at Spurs, it is better you avoid Trippier since you never know when he will be benched for the aforementioned Serge Aurier. 4. Hector Bellerin 11 points. (£5.9) selected by 10.5% of managers (536,290). A second member of the Arsenal back line, the speedster had his place under threat temporarily last season due to the presence and ability of Alex Oxlade Chamberlain to play in his Wing back position, well that threat is out of the way this season. Bellerin played 90 minutes to collect 2 points, had an assist which gave him 3 points, kept a clean sheet which earned him 4 points and collected 2 bonus points. Bellerin costs £5.9 and considering the fact that he plays an attacking wing back role, he is looking good for investment. Over the last 2 seasons he has scored 119 and 172 points respectively with last year’s tally coming despite not playing majority of the games towards the end of the season. IN those 2 seasons he collected a more than respectable 11 assists and 2 goals and he already has 1 assist this season that has put him in this list. He also has collected 4 bonus points this season and raked up 30 bonus points across the last 2 seasons, he clearly is a bonus point magnet. Arsenal have mixed fixtures over the next 10 games and if you are thinking of getting Bellerin, I would certainly not advise you against it. 5. Stephen Ward 12 points. (£4.6) selected by 6.9% of mangers (311,049). Stephen Ward has been somewhat an unknown quantity in fpl this season and has surprisingly been very good, he currently is the 4th best fpl defender ranked by points scored thus far. The Burnley man played 90 minutes garnering 2 points, had 1 assist getting 3 points, kept a clean sheet collecting 4 points and scooped all the 3 bonus points on offer. Ward doesn’t have an impressive fpl history but there is always a first season for every player, last season he scored a single goal and had one assist and this season he has already equaled that achievement in just 7 games. Lowly priced at £4.6, he is a good enabler and playing defender for managers looking to squeeze some cash from their defense in order to invest up front or in midfield. Ward is not a defender you should expect too much from every week and he is recommended as your third or 4th defender that you can use for rotation with another similarly priced defender depending on their fixtures. 1. Marouane Fellaini 16 points. (£4.9) selected by 2.0% of managers (44,913). The big haired Belgian is a very divisive figure, both in Old Trafford and in fpl. He once scored 168 fpl points so you can imagine why I am saying he is divisive. Fellaini scored 2 goals earning 10 points, played the entire 90 minutes getting 2 points, was part of a clean sheet keeping midfield which gave him 1 point and he grabbed all the 3 bonus points. Fellaini was once an fpl god garnering 168 points, but that was way back in 2012/2013 playing for Everton. Those days when he played every match and in his preferred no.10 role are now a distant memory and that is left of him now is a flat track bully used by Mourinho in a more defensive and can’t consistently start every match. His massive haul of 16 points was surely a one off and you cannot genuinely expect him to repeat it any time soon. Many would argue that with Paul Pogba out injured Fellaini should realistically have so much game time, this assumption couldn’t be further from the truth. Fellaini has the impressive Herrera to battle out with for a starting role in that midfield. I would not recommend anyone to have him in their team unless you are brave enough to endure him playing 20 or so minutes occasionally from the bench. 2. Kevin De Bruyne 11 points. (£10.0) selected by 16.4% of managers (826,875). The Belgian midfield master had an absolute whale of a time running the show in mid field against his former employers Chelsea. KDB scored 1 goal to get 5 points, played 90 minutes to get 2 points, was part of a clean sheet keeping midfield earning 1 point and scooped all the 3 bonus points on offer. I have had my reservations on having KDB this season as your Manchester City coverage, you can refer to my previous article to see the reasons why I believe he is not worth investment this season by clicking here. I still insist that if you need coverage from Manchester City’s midfield, you should turn to either David Silva £8.4 or Raheem Sterling £7.9 who will give you more points per million Value. 3. Abdoulaye Doucoure 10 points. (£ 5.3) selected by 11.6% of managers (550,057). For the record, Doucoure is a defensive midfielder despite posting impressive attacking returns so far. He scored a goal to earn him points, played 90 minutes getting 2 points and collected all the 3 bonus points on offer. The 24 year old French man has developed quite a reputation of popping up with occasional goals having netted 19 career goals in his young career of close to 150 games played. There has been a bandwagon to buy the Frenchman of Malian descent at this point of the season which has seen the midfielder’s price rise by £0.3, this bandwagon reminds me of the scramble to get in his team mate Ettiene Capoue early last season, we all know that the band wagon ended up costing managers dearly since Capoue could not sustain his goal scoring feats. Now, if you already own Doucoure, you might want to hold on to him for the sake of bench rotations. However, if you do not have him, do not be in a hurry to buy him, do not say you were not warned. 4. Richarlison de Andrade 10 points. (£6.1) selected by 5.9% of managers (261,290). Watford’s new hero has been impressive so far this season since signing on from Fluminese where he had 10 goals in 42 appearances. The 20 year old scored a goal to get 5 points, played 90 minutes to get 2 points and had an assist to collect 3 points. Watford has been a good attacking team under new manager Marcos Silva, Richarlison has been the most impressive player under the guidance of the former Hull city manager. He has scored 3 goals and has made 2 assists in 7 matches, which is no mean achievement for a new young player in the premier league. With the way Watford plays and the undeniable talent of Richarlison, you would want to buy him right now before his price goes up further as more managers realize how good he is as well as his relatively cheap price allowing you a little more budget freedom. Richarlison is definitely recommended despite facing Arsenal and Chelsea in their next 2 matches after the international break. Harry Kane 13 points. (£12.7) selected by 35.8% of managers (1,679,631). Kane started the season as the most expensive player in the game and little wonder so. Kane scored 2 goals for 8 points, played 86 minutes for 2 points and collected all the bonus points on offer. “Hurricane” requires no introduction to any premier league fan, he simply is the goal scoring king of White Hart lane and English football. In my previous article titled “Game week 7 captain picks”, I elaborated on how much you need have Harry Kane in your team, it still is somewhat of a mystery how he is neither the most owned player nor the most captained player thus far in the season. With Kane’s reputation and serious credentials to contest for the golden boot this season, Kane is becoming a must have, more so now that Aguero is out injured, Morata also injured as we go into the break. With the credentials of this week’s dream team evaluated and recommendations on every player made, I hope managers will have an easier time deciding who to bring in, who to dump and who to avoid. Also please join our competitive “Champions league” fpl league using the code 93110-26454 and measure yourself among the best managers. I also would love to hear your reactions in the comment section and also if you have any questions regarding your team, feel free to ask in our comments section.CHEERS!! !.